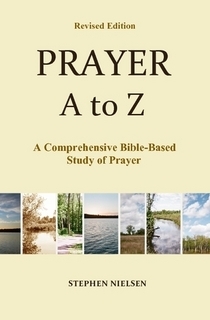 The following is an excrept from my e-book Prayer A to Z. 1. It is abstaining from food for spiritual purposes. The Hebrew word for fast (tsuwn) means “to cover the mouth.” The Greek word (nesteia) means “not to eat.” Therefore fasting means primarily to abstain from food. As for the second part of our description, “for spiritual reasons,” that comes from the Biblical context and from the purpose the Bible gives for fasting. Accordingly, it was for spiritual reasons that Jesus fasted, and why Moses, David, Elijah, and all the others fasted. And it is why the Bible teaches us to fast (Is. 58:6-9). We can certainly fast for other reasons, but, as I can see, the main reason why God has called us to fast is for spiritual reasons—to improve our relationship with God. Some would argue that our physical health is important to maintain our spiritual health. To some degree, I suppose that is true. If you are keeping your body healthy in order to please and serve God, then good health becomes for you a spiritual reason to fast. 2. It is abstaining from anything that hinders us spiritually. We should not restrict fasting to just food, because the whole purpose of fasting is to deny the body in order to be more spiritually minded. Therefore, when we fast for food, we should also abstain from other things like recreation, social relations, and even sleep—anything that may get in the way of our spiritual goal. 7. It is a way to prepare me so that the Holy Spirit’s power can flow and be effective in me. According to Prince, “Fasting breaks down the barriers in man’s carnal nature that stand in the way of the Holy Spirit’s omnipotence. Therefore, with these carnal barriers removed, the Holy Spirit can work unhindered in His fullness through our prayers.” Commenting on Ephesians 3:40, Prince writes, “The power that works in and through our prayers is the Holy Spirit. By removing the carnal barriers, fasting makes a way for the Holy Spirit’s omnipotence to work the ‘exceeding abundantly above’ of God’s promises.” Prince also points out that when Jesus began His fast He was full of the Holy Spirit (Lu. 4:1), but when He finished His fast he had the power of the Holy Spirit (Lu. 4:14). Hence, we can be full of the Holy Spirit but not empowered until we fast. Fasting is a way to make His power flow and be effective in us. 8. It is a way to express my earnestness as I plead and seek God in prayer. When David fasted over his dying child scripture says, “…[He] pleaded with God for the child…” When Daniel fasted as he prayed for his people, he said of himself, “Then I set my face toward the Lord…with fasting…” (Dan. 9:3). Again, in Joel 2:12, the Lord said to Israel, “Turn to Me with all your heart, with fasting…” These expressions—“pleaded with God,” “set my face,” and “turn to me” are all expressions of earnestness in prayer. They are important because they express to God, and also assure us, of the sincerity of our heart, which in turn will bring to pass the answer to our prayers. This entry was posted in Fasting and Prayer, Prayer A to Z Excerpts and tagged Andrew Murray, Daniel, Daniel 9:3, David, Derek Prince, Elijah, Fasting, Isaiah 58:6-9, Joel 2:12, Leviticus 23:27, Moses, Psalm 69:10, Ronald Dunn, Wesley Duewel. Bookmark the permalink.